Births announced this week are: Levi Ray Perkins, Oct. 20, son of Kevin and Amber Perkins; Elyna Morgan Perraut, May 31, daughter of Matthew and Lisa Perraut; Kimberly Mae Ring, Oct. 22, daughter of John and Linda Ring; Miracle Marye Switzer, Oct. 24, daughter of Randy and Angye Switzer; David Austin Smith, Aug. 21, son of Timmy and Tammie Smith; Kara Nicole Stamper, Sept. 12, daughter of Millard and Rayanna Stamper Jr.
Crista Rae-Jean Strawzell, 26, and Richard Thomas Crowdy, 27, married Oct. 1, 2011. Kathy Darlene Kessinger, 57, and James Donald Northcutt, 52, married Oct. 2, 2011. Lyndsie Arielle Noble, 20, andJames Aaron Morris, 21, married Oct. 8, 2011. 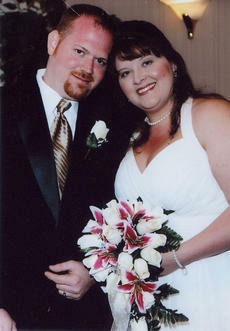 Kathy Lee Smith, 31, and Jason Daryl Angel, 31, married Sept. 21, 2011. 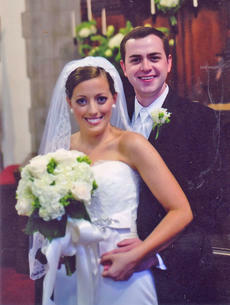 Amanda Faith Morris, 26, and Bobby James Brewer, 29, married Oct. 12, 2011. Kayla Renae Fryman, 21, and Nathan Scott Linville, 22, married Oct. 15, 2011. Former telephone operators will meet Saturday, Nov. 19 at 1 p.m. at Biancke’s for their annual reunion luncheon. Everyone should bring a gift. As families face a new economic “normal,” they are shifting toward a cultural change, perhaps permanent, that embraces being financially conservative. At home, this conservative behavior is illustrated by the rise in families who clip coupons, buy store brands, frequent discount stores, and delay purchases. Many family budgets now emphasize essential purchases, reducing debt and increasing savings, and limit treats and luxuries. 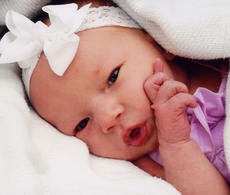 Madison Lynn Wood was born Aug. 4, 2011 at Central Baptist Hospital to Lucas and Stephanie Wood of Cynthiana. She weighed 6 lbs. 10 oz. Maternal grandparents ar Anthony and Karen Perkins of Cynthiana. Paternal grandparents are Jessie and Venita Wood of Cynthiana. 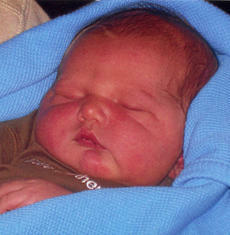 John Russ Vaughn was born to Kiley and Mia Vaughn of Cynthiana on Oct. 25, 2011 at Central Baptist Hospital, Lexington. He weighed 9 lbs. 9 oz., and is welcomed by his sister, Chandler Elizabeth. Maternal grandparents are John and Marsha Wright of Bourbon County; maternal great-grandparents are Elizabeth Wright of Bourbon County and the late Walton Wright, Linda Soper of Nicholas County and the late John E. Soper Jr., and H.C. Judy of Lexington and the late Millie Soper Judy. * Veteran’s Day, 11/11/11 - Thank you to all you special men and women who have defended and served our country and all of us through the years. No freedom is not free. We must remember this and teach this to our young people. * The Cynthiana-Harrison County Museum on Walnut Street has several displays dedicated to the military. One section has several huge binders filled with stories and photographs of Harrison County veterans. These stories truly will make you express gratitude. Andrea Dennis, daughter of Bobby and Kathy Dennis of Sunrise, Ky., and Danny Collier, son of David and Marietta Collier of Pendleton County, Ky., exchanged wedding vows on Sept. 9, 2011 in a private family ceremony at The Chapel At The Park in Gatlinburg, Tenn.
Taryn Collier, daughter of the groom, served as flower girl. A wedding shower was given in honor of the couple by Jennifer Robinson, sister of the bride. Dennis is employed as a Registered Nurse at Harrison Memorial Hospital in Cynthiana. Collier is employed by 3M Co. in Cynthiana. Haley Christine Trogdlen, daughter of Mr. and Mrs. Horrell C. Trogdlen of Owensboro, Ky., and James Mason McCauley, son of Mr. and Mrs. Lewis Scott McCauley of Cynthiana, Ky., were married at 6:30 p.m. on June 11, 2011, at Second Presbyterian Church in Lexington. The reception followed at Fasig-Tipton. Alivia Renee Whisman was born to Tasha Lane and Randy Whisman Jr. of Cynthiana on Sept. 26, 2011 at Harrison Memorial Hospital. She weighed 7 lbs. 8 oz., and is welcomed by her brothers Aiden and Addison Whisman and sister Alexis Whisman. Maternal grandparents are Angela and Stephen Richards and Eddie Lane of Cynthiana; maternal great-grandparens are Carolyn and Bronson Yazell and Francis and Walter Lane. Paternal grandparents are Rita and Shane Whirls and Randy and Brenda Whisman of Cynthiana.